DC 35 has always been a very active union. During the political season, staff and members are known among elected officials and candidates as a union that can mobilize the membership for sign holding, door knocking, phone banking, educating our members, and turning out votes. Members are called upon to attend community meetings, City Council meetings, and assist Organizing Department and Servicing Department with hand billing and bannering on job sites throughout our jurisdiction. Having an active membership builds our strength and shows that our membership is committed to the growth of our organization. Another example of our activism is displayed through community service and being a good partner to a society that we all live in. Recently, DC 35 had an opportunity to help with a project sponsored by Home for Wounded Warriors. This project was brought to our attention by a member, Doug Mitchell, and we were asked if DC 35 could be involved. DC 35 jumped in with both feet because this wasn’t just an average community service project, it was a house for a veteran severely wounded in the War On Terror, and had suffered multiple amputations. 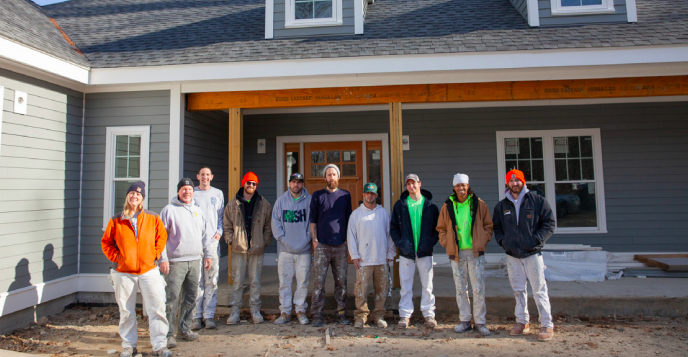 Homes for Wounded Warriors is an organization that builds houses specifically designed for service members that made the sacrifice of losing limbs in the defense of our country. In coordination with Eric Reading, Director of Apprenticeship and Training and his whole staff, we were able to come up with a schedule that would utilize the apprenticeship classes with the backing of journeymen and women to complete this project. We were able to secure a donation of all taping supplies from TJ McCartney and all the painting supplies from Select Paint (formally Paint Systems). 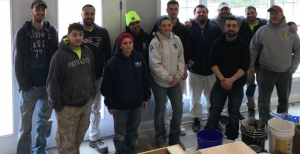 Over the course of six weeks a handful of journeymen and the 1st, 2nd, and 3rd-year drywall finishing, and commercial painting classes were at the Hanson, MA project getting on the job training and instruction while giving back to a service member that sacrificed for us. A reminder that we need to use every tool available if we want to win our political battles. Voting is our most important tool in winning for working families. Are you and your family members registered to vote? Have you moved recently and need to update your voter registration? Do you vote? These three things are not a heavy ask of you as a member of DC 35 but will go a long way towards building our political power and getting people elected that have our interests as a union in mind. If you need assistance with voter registration, visit your Secretary of State’s website or contact me at 617-593-0670. 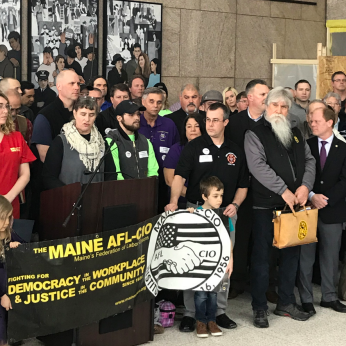 For the past 8 years the Maine AFL-CIO Labor Lobby Day was a grim event with the focus on playing defense against legislation that was filed to strip worker rights and protections. Now that Lepage is gone and replaced with Governor Janet Mills, and the House and Senate lead by staunch labor advocates, this year’s lobby day was upbeat and full of hope. Labor finally has a chance to tip the scales back to the favor of working families. 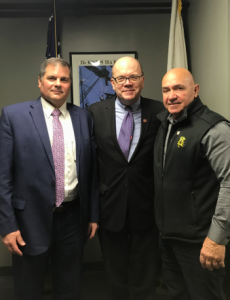 Representatives from DC 35 met with Governor Janet Mills, Senate President and IUPAT LU 1887 member Troy Jackson, and Speaker of the House Sara Gideon. Our discussions focused on Prevailing Wage fixes, Responsible Contractor Language, and leveling the playing field by rooting out wage theft. 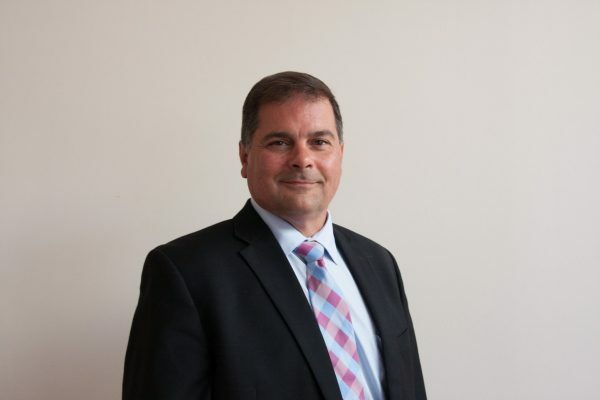 It was the first time that we felt upbeat and that our message was welcomed in all 3 parts of the Maine State House. DC 35 has been making the rounds with the Federal Delegation to discuss the issues with possible pension reform bills that could seriously affect our pension plan. We have been making it known that any fixes that are put into place to save failing pensions in other parts of the country should not adversely affect the DC 35 members that have voted time and time again to properly fund their pension. DC 35 has met with Senator Elizabeth Warren, Congressman Richard Neal, Congressman Jim McGovern, Congresswoman Katherine Clark, and Congresswoman Lori Trahan in an effort to educate them as to how any of the proposed fixes would affect our ability to make pension improvements for the membership.